Utah Legislature • Lockhart meets with lawmaker, will make a call in coming days. 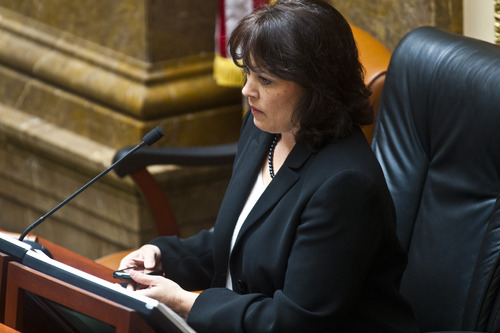 Chris Detrick | The Salt Lake Tribune House Speaker Becky Lockhart, R-Provo, listens during a special session in the House of Representatives at the Utah State Capitol Wednesday July 17, 2013. Chris Detrick | The Salt Lake Tribune Rep. V. Lowry Snow, R. St. George, listens during a special session in the House of Representatives at the Utah State Capitol Wednesday July 17, 2013. House Speaker Becky Lockhart met Monday with Rep. Lowry Snow, but said she hasn&apos;t decided whether legal work he did for a key player in the John Swallow scandal will prompt her to replace the St. George lawmaker as head of the House committee investigating Utah&apos;s top law-enforcement officer. "We met this morning," Lockhart said, "and within the next day or so or couple of days I&apos;ll probably have a decision" on whether Snow will stay on as chairman. The meeting came after The Salt Lake Tribune reported  less than 24 hours after Snow&apos;s July 17 appointment  that he had done legal work for Jeremy Johnson in 2008 and that he represents Johnson&apos;s associates in a Federal Trade Commission lawsuit against the St. George businessman and his I Works company. Snow has said he is willing to step aside if Lockhart asks him to do so, but he does not believe the legal work he did poses a conflict that would impede his objectivity. 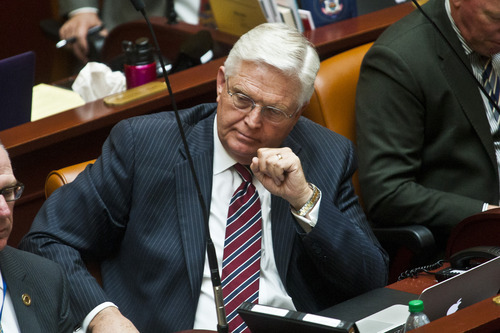 "Representative Snow has been president of the Utah State Bar. He knows the conflict-of-interest rules and ethics around being an attorney better than most anybody," Lockhart said. "We had a great discussion. What this is about is the House of Representatives and the public trust, so we want to do everything that will lead to establishing and strengthening the public trust." The Provo Republican, who appointed the committee, said the decision of whether to keep Snow as chair would be hers to make. Snow was counsel in 2008 for Johnson in a lawsuit filed against Johnson and his business associates, brothers Todd and Jason Vowell. Johnson was dismissed from the suit with Snow&apos;s name prominently listed as one of his attorneys on the motion to remove him. It was Johnson who sparked the attorney general scandal when he alleged that Swallow tried to help him arrange to bribe Senate Majority Leader Harry Reid, D-Nev., to fend off an FTC probe. Swallow insists he merely tried to help Johnson hire a lobbyist and denies wrongdoing. Reid has said he had no knowledge of any deal. Snow also represents several companies in the FTC case against Johnson in Nevada, trying to prevent a court-appointed receiver from freezing the assets of the businesses. The receiver believes Snow&apos;s clients had ties to Johnson&apos;s businesses and Johnson&apos;s associates, Todd and Jason Vowell. Snow also represented Paydirt, L.P.  a company started by the Vowells that did several business deals with Johnson  in a 2004 bankruptcy case in which it sought to recoup money invested with Wayne Reed Ogden, who pleaded guilty to several fraud counts. Lockhart said that she didn&apos;t know about Snow&apos;s work for the clients when she picked him to lead the committee. She would not say if she wished he had brought it up when they met last week. House Minority Leader Jennifer Seelig, who is on the committee, said that, for she and her fellow Democrats, "the public trust is paramount," and she anticipates Snow&apos;s involvement with the clients will be closely looked at, as it should be. "In all my interactions with Representative Snow in the time we&apos;ve served together," said Seelig, D-Salt Lake City, he&apos;s a really thoughtful and objective person and fair." But Seelig&apos;s party leader says Snow has to go. Jim Dabakis, Utah&apos;s Democratic Party chairman and a state senator, has said Lockhart, to regain public trust, should replace Snow with a Democrat to lead the committee. Right now, the panel has five Republicans and four Democrats. Thad Hall, a political scientist at the University of Utah, said Snow&apos;s involvement in peripheral legal matters shouldn&apos;t necessarily preclude him from leading the investigative committee. "As long as this person doesn&apos;t have a relationship with Swallow, I don&apos;t think this is a problem," Hall said. "The question is whether or not Swallow thinks it&apos;s a problem. If he doesn&apos;t see an issue with it, there probably isn&apos;t an issue with it." Swallow&apos;s attorney, Rod Snow, who is not related to Lowry Snow, has said he doesn&apos;t believe Rep. Snow&apos;s legal work should disqualify him. "I think Lowry is an attorney of integrity and sound judgment," Rod Snow said. In a recent letter to legislators, Swallow&apos;s attorneys challenged the wide scope of the investigation, arguing it should be limited to events since Swallow took office in January, but Rod Snow said the attorney general still plans to cooperate. "John&apos;s intent is and always has been to cooperate," Rod Snow said. "We reserve the right to challenge the investigation if we think the committee is exceeding its constitutional limits. However, we hope to avoid such a clash. A lot will depend on where the investigation heads and that remains to be seen." Lockhart rejected the request by Swallow&apos;s attorneys to allow their client to subpoena his own witnesses as part of the investigation and to allow him to be present for depositions and interviews. "We are disappointed in the speaker&apos;s position," Rod Snow said, "which may say something about whether she wants a fair and impartial investigation." The House committee is scheduled to hold its first meeting Aug. 6. A competitive contract for legal counsel for the panel is up for bid and a finalist is expected to be chosen by Aug. 9. Utah Gov. Gary Herbert has signed the five bills that lawmakers passed in their special session last week, including three dealing with a House committee&apos;s authority to investigate Attorney General John Swallow. The Legislature passed the trio of bills, which gave lawmakers the authority to hold some meetings  legal strategy sessions and depositions that may impede a criminal investigation if they were public  behind closed doors. Lawmakers also voted to allow out-of-state attorneys or investigators, if they are hired by the committee, to aid the panel without having to get a Utah license. On other fronts, Herbert signed legislation repealing a bill that sought to block federal officials from enforcing state laws within Utah, a measure that ended up getting the state sued by the U.S. Justice Department. He also approved a $3 million settlement of a 16-year-old land sale dispute between the state and owners of Deep Creek Ranch.